"AHR" redirects here. For other uses, see Ahr (disambiguation). The aryl hydrocarbon receptor (AhR or AHR or ahr or ahR) is a protein that in humans is encoded by the AHR gene. The aryl hydrocarbon receptor is a ligand-activated transcription factor involved in the regulation of biological responses to planar aromatic (aryl) hydrocarbons. This receptor has been shown to regulate xenobiotic-metabolizing enzymes such as cytochrome P450. The aryl hydrocarbon receptor is a member of the family of basic helix-loop-helix transcription factors. AHR binds several exogenous ligands such as natural plant flavonoids, polyphenolics and indoles, as well as synthetic polycyclic aromatic hydrocarbons and dioxin-like compounds. AhR is a cytosolic transcription factor that is normally inactive, bound to several co-chaperones. Upon ligand binding to chemicals such as 2,3,7,8-tetrachlorodibenzo-p-dioxin (TCDD), the chaperones dissociate resulting in AhR translocating into the nucleus and dimerizing with ARNT (AhR nuclear translocator), leading to changes in gene transcription. The AhR protein contains several domains critical for function and is classified as a member of the basic helix-loop-helix/Per-Arnt-Sim (bHLH/PAS) family of transcription factors. The bHLH motif is located in the N-terminal of the protein and is a common entity in a variety of transcription factors. Members of the bHLH superfamily have two functionally distinctive and highly conserved domains. The first is the basic-region (b), which is involved in the binding of the transcription factor to DNA. The second is the helix-loop-helix (HLH) region, which facilitates protein-protein interactions. Also contained with the AhR are two PAS domains, PAS-A and PAS-B, which are stretches of 200-350 amino acids that exhibit a high sequence homology to the protein domains that were originally found in the Drosophila genes period (Per) and single-minded (Sim) and in AhR’s dimerization partner the aryl hydrocarbon receptor nuclear translocator (ARNT). The PAS domains support specific secondary interactions with other PAS domain containing proteins, as is the case with AhR and ARNT, so that heterozygous and homozygous protein complexes can form. The ligand binding site of AhR is contained within the PAS-B domain and contains several conserved residues critical for ligand binding. Finally, a glutamine-rich (Q-rich) domain is located in the C-terminal region of the protein and is involved in co-activator recruitment and transactivation. Ahr ligands have been generally classified into two categories, synthetic or naturally occurring. The first ligands to be discovered were synthetic and members of the halogenated aromatic hydrocarbons (polychlorinated dibenzodioxins, dibenzofurans and biphenyls) and polycyclic aromatic hydrocarbons (3-methylcholanthrene, benzo[a]pyrene, benzanthracenes and benzoflavones). Research has focused on naturally occurring compounds with the hope of identifying an endogenous ligand. Naturally occurring compounds that have been identified as ligands of Ahr include derivatives of tryptophan such as indigo dye and indirubin, tetrapyrroles such as bilirubin, the arachidonic acid metabolites lipoxin A4 and prostaglandin G, modified low-density lipoprotein and several dietary carotenoids. One assumption made in the search for an endogenous ligand is that the ligand will be a receptor agonist. However, work by Savouret et al. has shown this may not be the case since their findings demonstrate that 7-ketocholesterol competitively inhibits Ahr signal transduction. AhR Signaling Pathway - Denison MS, Nagy SR (2003). "Activation of the aryl hydrocarbon receptor by structurally diverse exogenous and endogenous chemicals". Annu. Rev. Pharmacol. Toxicol. 43: 309-34. *Reprinted, with permission, from the Annual Review of Pharmacology and Toxicology, Volume 43 (c)2003 by Annual Reviews. Non-ligand bound Ahr is retained in the cytoplasm as an inactive protein complex consisting of a dimer of Hsp90, prostaglandin E synthase 3 (PTGES3, p23) and a single molecule of the immunophilin-like AH receptor-interacting protein, also known as hepatitis B virus X-associated protein 2 (XAP2), AhR interacting protein (AIP), and AhR-activated 9 (ARA9). The dimer of Hsp90, along with p23, has a multifunctional role in the protection of the receptor from proteolysis, constraining the receptor in a conformation receptive to ligand binding and preventing the premature binding of ARNT. AIP interacts with carboxyl-terminal of Hsp90 and binds to the AhR nuclear localization sequence (NLS) preventing the inappropriate trafficking of the receptor into the nucleus. Upon ligand binding to AhR, AIP is released resulting in exposure of the NLS, which is located in the bHLH region, leading to importation into the nucleus. It is presumed that once in the nucleus, Hsp90 dissociates exposing the two PAS domains allowing the binding of ARNT. The activated AhR/ARNT heterodimer complex is then capable of either directly and indirectly interacting with DNA by binding to recognition sequences located in the 5’- regulatory region of dioxin-responsive genes. The classical recognition motif of the AhR/ARNT complex, referred to as either the AhR-, dioxin- or xenobiotic- responsive element (AHRE, DRE or XRE), contains the core sequence 5’-GCGTG-3’ within the consensus sequence 5’-T/GNGCGTGA/CG/CA-3’ in the promoter region of AhR responsive genes. The AhR/ARNT heterodimer directly binds the AHRE/DRE/XRE core sequence in an asymmetric manner such that ARNT binds to 5’-GTG-3’ and AhR binding 5’-TC/TGC-3’. Recent research suggests that a second type of element termed AHRE-II, 5’-CATG(N6)C[T/A]TG-3’, is capable of indirectly acting with the AhR/ARNT complex. Regardless of the response element, the end result is a variety of differential changes in gene expression. In terms of evolution, the oldest physiological role of Ahr is in development. Ahr is presumed to have evolved from invertebrates where it served a ligand-independent role in normal development processes. The Ahr homolog in Drosophila, spineless (ss) is necessary for development of the distal segments of the antenna and leg. Ss dimerizes with tango (tgo), which is the homolog to the mammalian Arnt, to initiate gene transcription. Evolution of the receptor in vertebrates resulted in the ability to bind ligand and might have helped humans evolve to tolerate smoke of fires. In developing vertebrates, Ahr seemingly plays a role in cellular proliferation and differentiation. Despite lacking a clear endogenous ligand, AHR appears to play a role in the differentiation of many developmental pathways, including hematopoiesis, lymphoid systems, T-cells, neurons, and hepatocytes. AhR has also been found to have an important function in hematopoietic stem cells: AhR antagonism promotes their self-renewal and ex-vivo expansion and is involved in megakaryocyte differentiation. The adaptive response is manifested as the induction of xenobiotic metabolizing enzymes. Evidence of this response was first observed from the induction of cytochrome P450, family 1, subfamily A, polypeptide 1 (Cyp1a1) resultant from TCDD exposure, which was determined to be directly related to activation of the Ahr signaling pathway. The search for other metabolizing genes induced by Ahr ligands, due to the presence of DREs, has led to the identification of an "Ahr gene battery" of Phase I and Phase II metabolizing enzymes consisting of CYP1A1, CYP1A2, CYP1B1, NQO1, ALDH3A1, UGT1A2 and GSTA1. Presumably, vertebrates have this function to be able to detect a wide range of chemicals, indicated by the wide range of substrates Ahr is able to bind and facilitate their biotransformation and elimination. The AhR may also signal the presence of toxic chemicals in food and cause aversion of such foods. AhR activation seems to be also important for immunological responses and inhibiting inflammation  through upregulation of interleukin 22  and downregulation of Th17 response. The Knockdown of AHR mostly downregulates the expression of innate immunity genes in THP-1 cells. 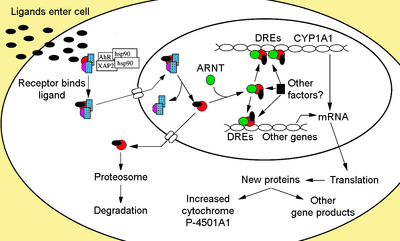 Extensions of the adaptive response are the toxic responses elicited by Ahr activation. Toxicity results from two different ways of Ahr signaling. The first is a side effect of the adaptive response in which the induction of metabolizing enzymes results in the production of toxic metabolites. For example, the polycyclic aromatic hydrocarbon benzo[a]pyrene (BaP), a ligand for Ahr, induces its own metabolism and bioactivation to a toxic metabolite via the induction of CYP1A1 and CYP1B1 in several tissues. The second approach to toxicity is the result of aberrant changes in global gene transcription beyond those observed in the "Ahr gene battery." These global changes in gene expression lead to adverse changes in cellular processes and function. Microarray analysis has proved most beneficial in understanding and characterizing this response. ↑ Burbach KM, Poland A, Bradfield CA (1992). "Cloning of the Ah-receptor cDNA reveals a distinctive ligand-activated transcription factor". Proc. Natl. Acad. Sci. U.S.A. 89 (17): 8185–9. doi:10.1073/pnas.89.17.8185. PMC 49882 . PMID 1325649. ↑ Fukunaga BN, Probst MR, Reisz-Porszasz S, Hankinson O (1995). "Identification of functional domains of the aryl hydrocarbon receptor". J. Biol. Chem. 270 (49): 29270–8. doi:10.1074/jbc.270.49.29270. PMID 7493958. ↑ Jones S (2004). "An overview of the basic helix-loop-helix proteins". Genome Biol. 5 (6): 226. doi:10.1186/gb-2004-5-6-226. PMC 463060 . PMID 15186484. ↑ Ema M, Sogawa K, Watanabe N, Chujoh Y, Matsushita N, Gotoh O, Funae Y, Fujii-Kuriyama Y (1992). "cDNA cloning and structure of mouse putative Ah receptor". Biochem. Biophys. Res. Commun. 184 (1): 246–53. doi:10.1016/0006-291X(92)91185-S. PMID 1314586. 1 2 Coumailleau P, Poellinger L, Gustafsson JA, Whitelaw ML (1995). "Definition of a minimal domain of the dioxin receptor that is associated with Hsp90 and maintains wild type ligand binding affinity and specificity". J. Biol. Chem. 270 (42): 25291–300. doi:10.1074/jbc.270.42.25291. PMID 7559670. ↑ Goryo K, Suzuki A, Del Carpio CA, Siizaki K, Kuriyama E, Mikami Y, Kinoshita K, Yasumoto K, Rannug A, Miyamoto A, Fujii-Kuriyama Y, Sogawa K (2007). "Identification of amino acid residues in the Ah receptor involved in ligand binding". Biochem. Biophys. Res. Commun. 354 (2): 396–402. doi:10.1016/j.bbrc.2006.12.227. PMID 17227672. ↑ Kumar MB, Ramadoss P, Reen RK, Vanden Heuvel JP, Perdew GH (2001). "The Q-rich subdomain of the human Ah receptor transactivation domain is required for dioxin-mediated transcriptional activity". J. Biol. Chem. 276 (45): 42302–10. doi:10.1074/jbc.M104798200. PMID 11551916. ↑ Denison MS, Pandini A, Nagy SR, Baldwin EP, Bonati L (2002). "Ligand binding and activation of the Ah receptor". Chem. Biol. Interact. 141 (1–2): 3–24. doi:10.1016/S0009-2797(02)00063-7. PMID 12213382. 1 2 3 Denison MS, Nagy SR (2003). "Activation of the aryl hydrocarbon receptor by structurally diverse exogenous and endogenous chemicals". Annu. Rev. Pharmacol. Toxicol. 43: 309–34. doi:10.1146/annurev.pharmtox.43.100901.135828. PMID 12540743. ↑ Adachi J, Mori Y, Matsui S, Takigami H, Fujino J, Kitagawa H, Miller CA, Kato T, Saeki K, Matsuda T (August 2001). "Indirubin and indigo are potent aryl hydrocarbon receptor ligands present in human urine". J. Biol. Chem. 276 (34): 31475–8. doi:10.1074/jbc.C100238200. PMID 11425848. ↑ Sinal CJ, Bend JR (1997). "Aryl hydrocarbon receptor-dependent induction of cyp1a1 by bilirubin in mouse hepatoma hepa 1c1c7 cells". Mol. Pharmacol. 52 (4): 590–9. PMID 9380021. ↑ Seidel SD, Winters GM, Rogers WJ, Ziccardi MH, Li V, Keser B, Denison MS (2001). "Activation of the Ah receptor signaling pathway by prostaglandins". J. Biochem. Mol. Toxicol. 15 (4): 187–96. doi:10.1002/jbt.16. PMID 11673847. ↑ McMillan BJ, Bradfield CA (2007). "The aryl hydrocarbon receptor is activated by modified low-density lipoprotein". Proc. Natl. Acad. Sci. U.S.A. 104 (4): 1412–7. doi:10.1073/pnas.0607296104. PMC 1783125 . PMID 17227852. ↑ Savouret JF, Antenos M, Quesne M, Xu J, Milgrom E, Casper RF (2001). "7-ketocholesterol is an endogenous modulator for the arylhydrocarbon receptor". J. Biol. Chem. 276 (5): 3054–9. doi:10.1074/jbc.M005988200. PMID 11042205. ↑ Denis M, Cuthill S, Wikström AC, Poellinger L, Gustafsson JA (1988). "Association of the dioxin receptor with the Mr 90,000 heat shock protein: a structural kinship with the glucocorticoid receptor". Biochem. Biophys. Res. Commun. 155 (2): 801–7. doi:10.1016/S0006-291X(88)80566-7. PMID 2844180. ↑ Perdew GH (1988). "Association of the Ah receptor with the 90-kDa heat shock protein". J. Biol. Chem. 263 (27): 13802–5. PMID 2843537. ↑ Cox MB, Miller CA (2004). "Cooperation of heat shock protein 90 and p23 in aryl hydrocarbon receptor signaling". Cell Stress Chaperones. 9 (1): 4–20. doi:10.1379/460.1. PMC 1065305 . PMID 15270073. 1 2 Kazlauskas A, Poellinger L, Pongratz I (1999). "Evidence that the co-chaperone p23 regulates ligand responsiveness of the dioxin (Aryl hydrocarbon) receptor". J. Biol. Chem. 274 (19): 13519–24. doi:10.1074/jbc.274.19.13519. PMID 10224120. ↑ Kazlauskas A, Sundström S, Poellinger L, Pongratz I (2001). "The hsp90 chaperone complex regulates intracellular localization of the dioxin receptor". Mol. Cell. Biol. 21 (7): 2594–607. doi:10.1128/MCB.21.7.2594-2607.2001. PMC 86890 . PMID 11259606. 1 2 Shetty PV, Bhagwat BY, Chan WK (2003). "P23 enhances the formation of the aryl hydrocarbon receptor-DNA complex". Biochem. Pharmacol. 65 (6): 941–8. doi:10.1016/S0006-2952(02)01650-7. PMID 12623125. ↑ Meyer BK, Pray-Grant MG, Vanden Heuvel JP, Perdew GH (1998). "Hepatitis B virus X-associated protein 2 is a subunit of the unliganded aryl hydrocarbon receptor core complex and exhibits transcriptional enhancer activity". Mol. Cell. Biol. 18 (2): 978–88. PMC 108810 . PMID 9447995. ↑ Ma Q, Whitlock JP (1997). "A novel cytoplasmic protein that interacts with the Ah receptor, contains tetratricopeptide repeat motifs, and augments the transcriptional response to 2,3,7,8-tetrachlorodibenzo-p-dioxin". J. Biol. Chem. 272 (14): 8878–84. doi:10.1074/jbc.272.14.8878. PMID 9083006. ↑ Carver LA, Bradfield CA (1997). "Ligand-dependent interaction of the aryl hydrocarbon receptor with a novel immunophilin homolog in vivo". J. Biol. Chem. 272 (17): 11452–6. doi:10.1074/jbc.272.17.11452. PMID 9111057. ↑ Carver LA, Jackiw V, Bradfield CA (1994). "The 90-kDa heat shock protein is essential for Ah receptor signaling in a yeast expression system". J. Biol. Chem. 269 (48): 30109–12. PMID 7982913. ↑ Pongratz I, Mason GG, Poellinger L (1992). "Dual roles of the 90-kDa heat shock protein hsp90 in modulating functional activities of the dioxin receptor. Evidence that the dioxin receptor functionally belongs to a subclass of nuclear receptors that require hsp90 both for ligand-binding activity and repression of intrinsic DNA binding activity". J. Biol. Chem. 267 (19): 13728–34. PMID 1320028. 1 2 3 Whitelaw M, Pongratz I, Wilhelmsson A, Gustafsson JA, Poellinger L (1993). "Ligand-dependent recruitment of the Arnt coregulator determines DNA recognition by the dioxin receptor". Mol. Cell. Biol. 13 (4): 2504–14. PMC 359572 . PMID 8384309. ↑ Carver LA, LaPres JJ, Jain S, Dunham EE, Bradfield CA (1998). "Characterization of the Ah receptor-associated protein, ARA9". J. Biol. Chem. 273 (50): 33580–7. doi:10.1074/jbc.273.50.33580. PMID 9837941. ↑ Petrulis JR, Hord NG, Perdew GH (2000). "Subcellular localization of the aryl hydrocarbon receptor is modulated by the immunophilin homolog hepatitis B virus X-associated protein 2". J. Biol. Chem. 275 (48): 37448–53. doi:10.1074/jbc.M006873200. PMID 10986286. ↑ Petrulis JR, Kusnadi A, Ramadoss P, Hollingshead B, Perdew GH (2003). "The hsp90 Co-chaperone AIP alters importin beta recognition of the bipartite nuclear localization signal of the Ah receptor and represses transcriptional activity". J. Biol. Chem. 278 (4): 2677–85. doi:10.1074/jbc.M209331200. PMID 12431985. ↑ Ikuta T, Eguchi H, Tachibana T, Yoneda Y, Kawajiri K (1998). "Nuclear localization and export signals of the human aryl hydrocarbon receptor". J. Biol. Chem. 273 (5): 2895–904. doi:10.1074/jbc.273.5.2895. PMID 9446600. ↑ Pollenz RS, Barbour ER (2000). "Analysis of the complex relationship between nuclear export and aryl hydrocarbon receptor-mediated gene regulation". Mol. Cell. Biol. 20 (16): 6095–104. doi:10.1128/MCB.20.16.6095-6104.2000. PMC 86085 . PMID 10913191. ↑ Hoffman EC, Reyes H, Chu FF, Sander F, Conley LH, Brooks BA, Hankinson O (1991). "Cloning of a factor required for activity of the Ah (dioxin) receptor". Science. 252 (5008): 954–8. doi:10.1126/science.1852076. PMID 1852076. 1 2 Probst MR, Reisz-Porszasz S, Agbunag RV, Ong MS, Hankinson O (1993). "Role of the aryl hydrocarbon receptor nuclear translocator protein in aryl hydrocarbon (dioxin) receptor action". Mol. Pharmacol. 44 (3): 511–8. PMID 8396713. ↑ Reyes H, Reisz-Porszasz S, Hankinson O (1992). "Identification of the Ah receptor nuclear translocator protein (Arnt) as a component of the DNA binding form of the Ah receptor". Science. 256 (5060): 1193–5. doi:10.1126/science.256.5060.1193. PMID 1317062. ↑ Dolwick KM, Swanson HI, Bradfield CA (1993). "In vitro analysis of Ah receptor domains involved in ligand-activated DNA recognition". Proc. Natl. Acad. Sci. U.S.A. 90 (18): 8566–70. doi:10.1073/pnas.90.18.8566. PMC 47398 . PMID 8397410. ↑ Shen ES, Whitlock JP (1992). "Protein-DNA interactions at a dioxin-responsive enhancer. Mutational analysis of the DNA-binding site for the liganded Ah receptor". J. Biol. Chem. 267 (10): 6815–9. PMID 1313023. ↑ Lusska A, Shen E, Whitlock JP (1993). "Protein-DNA interactions at a dioxin-responsive enhancer. Analysis of six bona fide DNA-binding sites for the liganded Ah receptor". J. Biol. Chem. 268 (9): 6575–80. PMID 8384216. ↑ Yao EF, Denison MS (1992). "DNA sequence determinants for binding of transformed Ah receptor to a dioxin-responsive enhancer". Biochemistry. 31 (21): 5060–7. doi:10.1021/bi00136a019. PMID 1318077. ↑ Bacsi SG, Reisz-Porszasz S, Hankinson O (1995). "Orientation of the heterodimeric aryl hydrocarbon (dioxin) receptor complex on its asymmetric DNA recognition sequence". Mol. Pharmacol. 47 (3): 432–8. PMID 7700240. ↑ Swanson HI, Chan WK, Bradfield CA (1995). "DNA binding specificities and pairing rules of the Ah receptor, ARNT, and SIM proteins". J. Biol. Chem. 270 (44): 26292–302. doi:10.1074/jbc.270.44.26292. PMID 7592839. ↑ Boutros PC, Moffat ID, Franc MA, Tijet N, Tuomisto J, Pohjanvirta R, Okey AB (2004). "Dioxin-responsive AHRE-II gene battery: identification by phylogenetic footprinting". Biochem. Biophys. Res. Commun. 321 (3): 707–15. doi:10.1016/j.bbrc.2004.06.177. PMID 15358164. ↑ Sogawa K, Numayama-Tsuruta K, Takahashi T, Matsushita N, Miura C, Nikawa J, Gotoh O, Kikuchi Y, Fujii-Kuriyama Y (2004). "A novel induction mechanism of the rat CYP1A2 gene mediated by Ah receptor-Arnt heterodimer". Biochem. Biophys. Res. Commun. 318 (3): 746–55. doi:10.1016/j.bbrc.2004.04.090. PMID 15144902. ↑ Hahn ME, Karchner SI, Evans BR, Franks DG, Merson RR, Lapseritis JM (2006). "Unexpected diversity of aryl hydrocarbon receptors in non-mammalian vertebrates: insights from comparative genomics". J. Exp. Zoolog. Part a Comp. Exp. Biol. 305 (9): 693–706. doi:10.1002/jez.a.323. PMID 16902966. ↑ Duncan DM, Burgess EA, Duncan I (1998). "Control of distal antennal identity and tarsal development in Drosophila by spineless-aristapedia, a homolog of the mammalian dioxin receptor". Genes Dev. 12 (9): 1290–303. doi:10.1101/gad.12.9.1290. PMC 316766 . PMID 9573046. ↑ Emmons RB, Duncan D, Estes PA, Kiefel P, Mosher JT, Sonnenfeld M, Ward MP, Duncan I, Crews ST (September 1999). "The spineless-aristapedia and tango bHLH-PAS proteins interact to control antennal and tarsal development in Drosophila". Development. 126 (17): 3937–45. PMID 10433921. 1 2 Tijet N, Boutros PC, Moffat ID, Okey AB, Tuomisto J, Pohjanvirta R (2006). "Aryl hydrocarbon receptor regulates distinct dioxin-dependent and dioxin-independent gene batteries". Mol. Pharmacol. 69 (1): 140–53. doi:10.1124/mol.105.018705. PMID 16214954. ↑ Gasiewicz TA, Singh KP, Casado FL (March 2010). "The aryl hydrocarbon receptor has an important role in the regulation of hematopoiesis: implications for benzene-induced hematopoietic toxicity". Chem. Biol. Interact. 184 (1-2): 246–51. doi:10.1016/j.cbi.2009.10.019. PMC 2846208 . PMID 19896476. ↑ Kiss EA, Vonarbourg C, Kopfmann S, Hobeika E, Finke D, Esser C, Diefenbach A (December 2011). "Natural aryl hydrocarbon receptor ligands control organogenesis of intestinal lymphoid follicles". Science. 334 (6062): 1561–5. doi:10.1126/science.1214914. PMID 22033518. 1 2 Li Y, Innocentin S, Withers DR, Roberts NA, Gallagher AR, Grigorieva EF, Wilhelm C, Veldhoen M (October 2011). "Exogenous stimuli maintain intraepithelial lymphocytes via aryl hydrocarbon receptor activation". Cell. 147 (3): 629–40. doi:10.1016/j.cell.2011.09.025. PMID 21999944. ↑ Quintana FJ, Basso AS, Iglesias AH, Korn T, Farez MF, Bettelli E, Caccamo M, Oukka M, Weiner HL (2008). "Control of T(reg) and T(H)17 cell differentiation by the aryl hydrocarbon receptor". Nature. 1 (453): 65–71. doi:10.1038/nature06880. PMID 18362915. ↑ Akahoshi E, Yoshimura S, Ishihara-Sugano M (2006). "Over-expression of AhR (aryl hydrocarbon receptor) induces neural differentiation of Neuro2a cells: neurotoxicology study". Environ Health. 1 (5): 24. doi:10.1186/1476-069X-5-24. PMC 1570454 . PMID 16956419. ↑ Walisser JA, Glover E, Pande K, Liss AL, Bradfield CA (2005). "Aryl hydrocarbon receptor-dependent liver development and hepatotoxicity are mediated by different cell types". Proc Natl Acad Sci U S A. 102 (49): 17858–63. doi:10.1073/pnas.0504757102. PMC 1308889 . PMID 16301529. ↑ Boitano AE, Wang J, Romeo R, Bouchez LC, Parker AE, Sutton SE, Walker JR, Flaveny CA, Perdew GH, Denison MS, Schultz PG, Cooke MP (September 2010). "Aryl hydrocarbon receptor antagonists promote the expansion of human hematopoietic stem cells". Science. 329 (5997): 1345–8. doi:10.1126/science.1191536. PMC 3033342 . PMID 20688981. ↑ Lindsey S, Papoutsakis ET (2011). "The aryl hydrocarbon receptor (AHR) transcription factor regulates megakaryocytic polyploidization". Br J Haematol. 152 (4): 469–84. doi:10.1111/j.1365-2141.2010.08548.x. PMC 3408620 . PMID 21226706. ↑ Israel DI, Whitlock JP (1983). "Induction of mRNA specific for cytochrome P1-450 in wild type and variant mouse hepatoma cells". J. Biol. Chem. 258 (17): 10390–4. PMID 6885786. ↑ Israel DI, Whitlock JP (1984). "Regulation of cytochrome P1-450 gene transcription by 2,3,7, 8-tetrachlorodibenzo-p-dioxin in wild type and variant mouse hepatoma cells". J. Biol. Chem. 259 (9): 5400–2. PMID 6715350. ↑ Ko HP, Okino ST, Ma Q, Whitlock JP (1996). "Dioxin-induced CYP1A1 transcription in vivo: the aromatic hydrocarbon receptor mediates transactivation, enhancer-promoter communication, and changes in chromatin structure". Mol. Cell. Biol. 16 (1): 430–6. PMC 231019 . PMID 8524325. ↑ Nebert DW, Roe AL, Dieter MZ, Solis WA, Yang Y, Dalton TP (2000). "Role of the aromatic hydrocarbon receptor and [Ah] gene battery in the oxidative stress response, cell cycle control, and apoptosis". Biochem. Pharmacol. 59 (1): 65–85. doi:10.1016/S0006-2952(99)00310-X. PMID 10605936. ↑ Lensu S, Tuomisto JT, Tuomisto J, Viluksela M, Niittynen M, Pohjanvirta R (June 2011). "Immediate and highly sensitive aversion response to a novel food item linked to AH receptor stimulation". Toxicol. Lett. 203 (3): 252–7. doi:10.1016/j.toxlet.2011.03.025. PMID 21458548. ↑ Monteleone I, Rizzo A, Sarra M, Sica G, Sileri P, Biancone L, MacDonald TT, Pallone F, Monteleone G (July 2011). "Aryl hydrocarbon receptor-induced signals up-regulate IL-22 production and inhibit inflammation in the gastrointestinal tract". Gastroenterology. 141 (1): 237–48, 248.e1. doi:10.1053/j.gastro.2011.04.007. PMID 21600206. ↑ Wei P, Hu GH, Kang HY, Yao HB, Kou W, Liu H, Zhang C, Hong SL (May 2014). "An aryl hydrocarbon receptor ligand acts on dendritic cells and T cells to suppress the Th17 response in allergic rhinitis patients.". Lab Invest. 94 (5): 528–35. doi:10.1038/labinvest.2014.8. PMID 24514067. ↑ Memari B, Bouttier M, Dimitrov V, Ouellette M, Behr MA, Fritz JH, White JH (Nov 2015). "Engagement of the Aryl Hydrocarbon Receptor in Mycobacterium tuberculosis-Infected Macrophages Has Pleiotropic Effects on Innate Immune Signaling". Journal of Immunology. 195 (9): 4479–91. doi:10.4049/jimmunol.1501141. PMID 26416282. ↑ Harrigan JA, Vezina CM, McGarrigle BP, Ersing N, Box HC, Maccubbin AE, Olson JR (February 2004). "DNA adduct formation in precision-cut rat liver and lung slices exposed to benzo[a]pyrene". Toxicol. Sci. 77 (2): 307–14. doi:10.1093/toxsci/kfh030. PMID 14691214. ↑ Lindén J, Lensu S, Tuomisto J, Pohjanvirta R (October 2010). "Dioxins, the aryl hydrocarbon receptor and the central regulation of energy balance". Front Neuroendocrinol. 31 (4): 452–78. doi:10.1016/j.yfrne.2010.07.002. PMID 20624415. ↑ Martinez JM, Afshari CA, Bushel PR, Masuda A, Takahashi T, Walker NJ (2002). "Differential toxicogenomic responses to 2,3,7,8-tetrachlorodibenzo-p-dioxin in malignant and nonmalignant human airway epithelial cells". Toxicol. Sci. 69 (2): 409–23. doi:10.1093/toxsci/69.2.409. PMID 12377990. ↑ Vezina CM, Walker NJ, Olson JR (2004). "Subchronic exposure to TCDD, PeCDF, PCB126, and PCB153: effect on hepatic gene expression". Environ. Health Perspect. 112 (16): 1636–44. doi:10.1289/ehp.7253. PMC 1247661 . PMID 15598615. ↑ Ovando BJ, Vezina CM, McGarrigle BP, Olson JR (2006). "Hepatic gene downregulation following acute and subchronic exposure to 2,3,7,8-tetrachlorodibenzo-p-dioxin". Toxicol. Sci. 94 (2): 428–38. doi:10.1093/toxsci/kfl111. PMID 16984957. ↑ Hogenesch JB, Chan WK, Jackiw VH, Brown RC, Gu YZ, Pray-Grant M, Perdew GH, Bradfield CA (1997). "Characterization of a subset of the basic-helix-loop-helix-PAS superfamily that interacts with components of the dioxin signaling pathway". J. Biol. Chem. 272 (13): 8581–93. doi:10.1074/jbc.272.13.8581. PMID 9079689. ↑ Tian Y, Ke S, Chen M, Sheng T (2003). "Interactions between the aryl hydrocarbon receptor and P-TEFb. Sequential recruitment of transcription factors and differential phosphorylation of C-terminal domain of RNA polymerase II at cyp1a1 promoter". J. Biol. Chem. 278 (45): 44041–8. doi:10.1074/jbc.M306443200. PMID 12917420. ↑ Wormke M, Stoner M, Saville B, Walker K, Abdelrahim M, Burghardt R, Safe S (2003). "The aryl hydrocarbon receptor mediates degradation of estrogen receptor alpha through activation of proteasomes". Mol. Cell. Biol. 23 (6): 1843–55. doi:10.1128/MCB.23.6.1843-1855.2003. PMC 149455 . PMID 12612060. ↑ Klinge CM, Kaur K, Swanson HI (2000). "The aryl hydrocarbon receptor interacts with estrogen receptor alpha and orphan receptors COUP-TFI and ERRalpha1". Arch. Biochem. Biophys. 373 (1): 163–74. doi:10.1006/abbi.1999.1552. PMID 10620335. ↑ Beischlag TV, Wang S, Rose DW, Torchia J, Reisz-Porszasz S, Muhammad K, Nelson WE, Probst MR, Rosenfeld MG, Hankinson O (2002). "Recruitment of the NCoA/SRC-1/p160 family of transcriptional coactivators by the aryl hydrocarbon receptor/aryl hydrocarbon receptor nuclear translocator complex". Mol. Cell. Biol. 22 (12): 4319–33. doi:10.1128/MCB.22.12.4319-4333.2002. PMC 133867 . PMID 12024042. ↑ Antenos M, Casper RF, Brown TJ (2002). "Interaction with Nedd8, a ubiquitin-like protein, enhances the transcriptional activity of the aryl hydrocarbon receptor". J. Biol. Chem. 277 (46): 44028–34. doi:10.1074/jbc.M202413200. PMID 12215427. ↑ Kumar MB, Tarpey RW, Perdew GH (1999). "Differential recruitment of coactivator RIP140 by Ah and estrogen receptors. Absence of a role for LXXLL motifs". J. Biol. Chem. 274 (32): 22155–64. doi:10.1074/jbc.274.32.22155. PMID 10428779. ↑ Kim DW, Gazourian L, Quadri SA, Romieu-Mourez R, Sherr DH, Sonenshein GE (2000). "The RelA NF-kappaB subunit and the aryl hydrocarbon receptor (AhR) cooperate to transactivate the c-myc promoter in mammary cells". Oncogene. 19 (48): 5498–506. doi:10.1038/sj.onc.1203945. PMID 11114727. ↑ Ruby CE, Leid M, Kerkvliet NI (2002). "2,3,7,8-Tetrachlorodibenzo-p-dioxin suppresses tumor necrosis factor-alpha and anti-CD40-induced activation of NF-kappaB/Rel in dendritic cells: p50 homodimer activation is not affected". Mol. Pharmacol. 62 (3): 722–8. doi:10.1124/mol.62.3.722. PMID 12181450. ↑ Vogel CF, Sciullo E, Li W, Wong P, Lazennec G, Matsumura F (2007). "RelB, a new partner of aryl hydrocarbon receptor-mediated transcription". Molecular Endocrinology (Baltimore, Md.). 21 (12): 2941–55. doi:10.1210/me.2007-0211. PMC 2346533 . PMID 17823304. ↑ Ge NL, Elferink CJ (1998). "A direct interaction between the aryl hydrocarbon receptor and retinoblastoma protein. Linking dioxin signaling to the cell cycle". J. Biol. Chem. 273 (35): 22708–13. doi:10.1074/jbc.273.35.22708. PMID 9712901.